There are 2 posts tagged hds (this is page 1 of 1). HDS also provides a SRA to connect to its storage arrays. But only installing the SRA won’t get the storage array to be recognized by SRM. The picture below gives a graphical representation of the component needed to let SRM communicate with the HDS storage array. The HDS SRA 2.0 needs an instance of the HDS Command Control Interface (CCI) to communicate to the HDS storage array. The HDS CCI is storage box management software which is provided by HDS. This can be installed on the SRM server next to SRM and the SRA. To create an instance of the HDS CCI a Hitachi Online Remote Copy Manager (HORCM) service is defined manually on the Windows host. 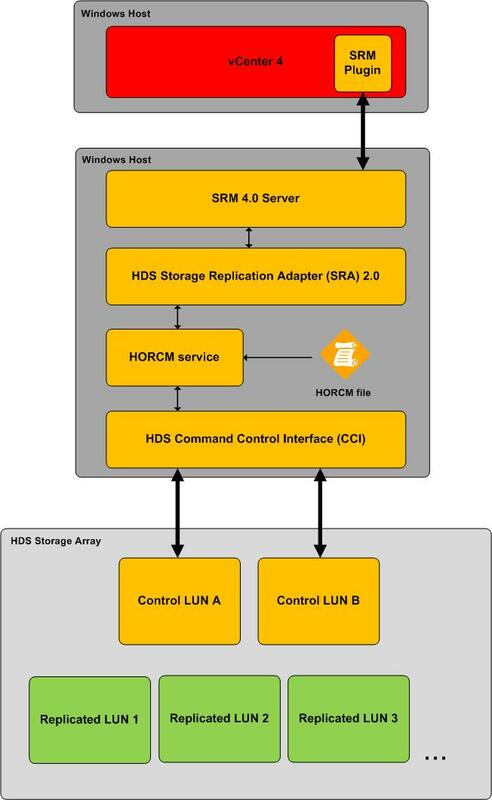 The HDS CCI manages the storage array(s) through the defined control LUNs on each storage array. The HORCM service is configured in the HORCM file. This file defines which LUNs are replicated between the protected and the recovery site. These LUNs are the LUNs that SRM can see and which it can managed for Disaster Recovery and testing purposes. During configuration the HDS SRA is pointed to the HORCM instance which manages the storage array(s). All this provides the HDS SRA with the information which it passes through to the SRM server. This creates the connection between the SRM server and the storage array necessary for SRM to work. 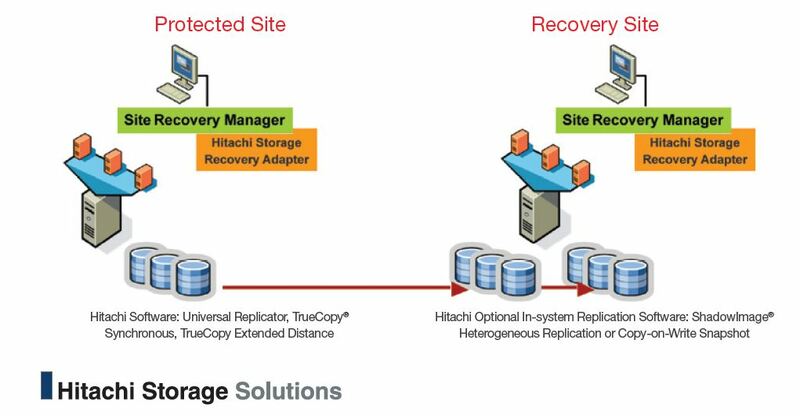 For more information look at the VMware vCenter Site Recovery Manager Deployment created by HDS. Follow its step-by-step instructions carefully while it is essential getting HDS to work with SRM.